You’ve got to be kidding me. 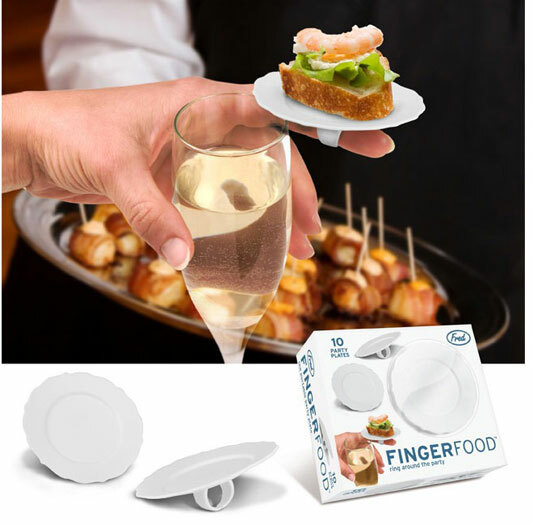 Can you imagine yourself at a cocktail party with a tiny plastic tray on your finger holding one canape and then having to go back to the grazing table repeatedly to put another little tidbit on your tiny plastic finger plate? The ad copy for these on www.spoonsisters.com says you can hold a drink and this stupid tray in one hand while greeting guests with the other. And then after you’ve clasped hands firmly with your germy guests you can pick up your hors d’oeuvre and get all that germiness in your digestive system. Plus you have to handwash these suckers.